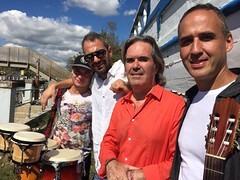 The innovative design of the Company Miguel Fernandez Group is to present flamenco in all its greatness by linking its rich tradition with new musical trends, thus creating a language all its own and original. Therefore come up to the group ethnic percussion of ancient tradition, fretless bass, which joining the flamenco concert guitar inspired to unusual harmonies of the school of the famous Paco de Lucia, merge with dance, singing and clapping in a unique dialogue of high expression in each of their performance. Their artists from Spain and Argentina are part of the most genuine current flamenco scene, with long standing international experience, participating with great dedication to a significant creative research of choreography, art and music, giving shape to a completely original project. 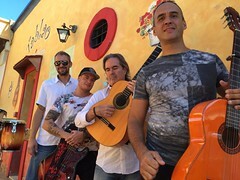 The performance Pasión Flamenca is composed of three parts that have a continuity but with a unique common language, the dialogue between improvisation and rules; original flamenco concert guitar pieces that merge together to voice, instruments, percussion and claps, including absolutely original compositions of the famous spanish poet and writer Federico Garcia Lorca re-arranged of lyrics, music and dance, and so with an ever-growing crescendo head us towards the flamenco “puro” plenty of energy and final fiesta. Talented of a great rythmic effect and excellent artistic individuality, the group performance is well characterized for his authenticity on the repertoire and choreography proposed, and for the enthusiastic public welcoming on every situation. The group is able to modify the programme, to satisfy any requirement on the different situations.